My fondest memory of teaching high school is not what you might expect. 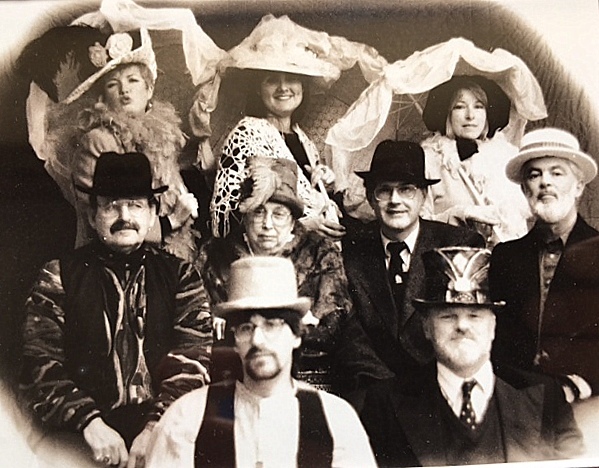 It’s not of the many commencement ceremonies I watched or took part in, nor of reading the often brilliant work produced by some of my students, or even of the moving Remembrance Day ceremonies that my writing classes scripted. Those moments made me proud. But the memory that always makes me smile is of the 1999 end-of-year assembly when three of my teacher-buddies and I made total fools of ourselves on stage. Wearing black mini-skirts (not too short, of course), high black boots, and sporting backcombed, bouffant hair, we pranced around on stage in front of the whole school doing our best lip-syncing routine to Nancy Sinatra’s “These Boots Are Made for Walking.” The kids went nuts. I’ll never forget looking down at several of my grade nine students in the front row of the audience, screaming, “Ms. Bur-paaaaay!” Ha. I’m smiling as I write this. I started thinking of that day on stage at Nepean High School after I watched a video posted on Facebook by Emily, a former student. Funnily enough, a former student who is now a teacher herself. In the video, comedian Christian Hull role-plays being a teacher. I winced in a few places, and laughed out loud in others. Have a look. Watching the video made me groan, and roll my eyes, and think of all the embarrassing, cringe-worthy moments I’ve had in the classroom. Like the time I was teaching science. Yep, I taught science. I was qualified to teach Biology and General Science, but it was not my forté. Not by a long shot. Science classrooms have an elevated lab bench (for demonstrations) at the front instead of a teacher’s desk. Elevated being the operative word here. 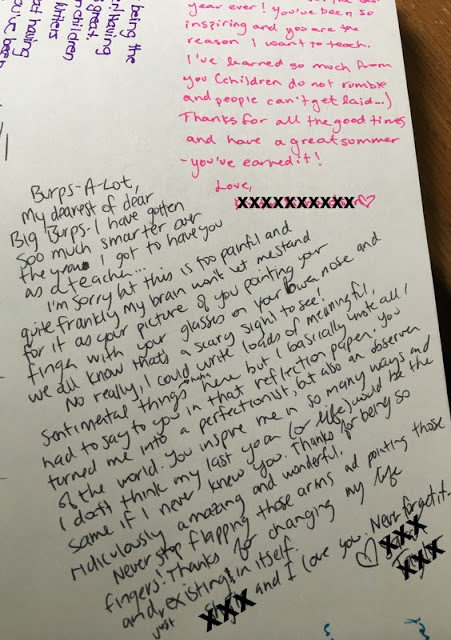 So, I was talking to the class, writing notes on the board, turning and talking some more, and writing, writing, writing on the board, slowly working my way across the front of the class. Until I stepped off the end of the platform into mid-air. And disappeared. Well, I disappeared from the view of most of the kids, except the shocked ones in the front row looking down at me on the floor. Ha. Then there was the time I was rushing to class, from an early morning meeting that had run late. The ten minute warning bell rang, and those of us who had a first period class had to run out while the principal was still speaking. I ran up four flights of stairs, and down a hall that stretched the entire length of the school to my classroom at the end. In high heels. The kids milling around outside my still-locked classroom door were a bit surprised when my heel caught on something, and I flew horizontally into an open locker. Ouch. That one hurt. It seems there’s a lot of physical comedy involved in teaching, folks, even if it is unintentional. Or. My favourite cringe-worthy moment was early in my career. I was struggling with discipline in one of my classes, a very large grade ten English class. Thirty-four students, most of whom were boys. Trust me, the gender balance in a class really makes a difference. I actually loved this class, most of the time. But five or six boys who were all best buddies, who were really smart, and very witty, and who could pretty much ruin a class with their antics were driving me crazy. I was too scared to ask for help from the vice-principal. Like most young teachers, I thought that meant I looked a failure in the eyes of my superiors. So I soldiered on. On a long road-trip over the March Break, Hubby and I brainstormed an entire new approach to a unit I was working on that would involve a modular approach, more fun activities, and a clever strategy to “divide and conquer” … so to speak. I have no memory whether they behaved any better after that. I doubt it. I was too busy worrying that their parents would find out, and tell the principal, and I would get fired. But a few years later, when a friend and I were at the movies and the theatre was packed, I saw four of the boys in the row right in front of us. “Oh god,” I murmured, as I shrank down in my seat. Then one of them spied me. “Ms. B!” he hooted. “Guys, it’s Ms. Burpee.” He grinned, “Hey, remember the time in grade ten when you called us assholes? That was the best!” Ha. I still smile when I think of that…. probably the only thing they remembered from grade ten English. Student “good-byes” in my JMSS yearbook, 2011. As a classroom teacher I learned early not to take myself too seriously. I took my job seriously, but I stopped worrying if I looked silly when I was doing it. I’d get very animated when I told stories, and wave my hands around. I used to imitate “my mother’s look,” as I called it, putting my glasses on the end of my nose and looking at the class over the top of them, waving my finger and saying, “Never, never make fun of my name in front of me.” They loved that. Especially, when one male teacher who always called me Burps, stuck his head into my class one day and said, “Burps, you going to the meeting after school?” Ha. I remember I looked at him over my glasses and said, “You are in so much trouble, Mister.” But no one ever called me Burps in my class. After class, all bets were off. I love how the one student, above, addressed her good-bye message in my yearbook. And I love that the other student says I was the reason she wanted to be a teacher. Gad. That’s makes me tear up. I particularly love that during my last year teaching she came to work with me in my classroom as a student teacher. That was lovely. One student’s…uh… honest message in my 1999 yearbook. But, you know, it’s madness to think that as teachers we can inspire every kid. Many students just want to get their credit and move on. The note above was written the year our school was so crowded we had to timetable an extra class that started at 8:00 a.m. If I had a hard time being energetic at that hour, the kids were worse. I brought a thermos of tea from home for myself, and encouraged my students to do the same, sometimes we had doughnuts. Whatever it took to make the new schedule more “civilized” for kids who had to come to school an hour earlier than usual. 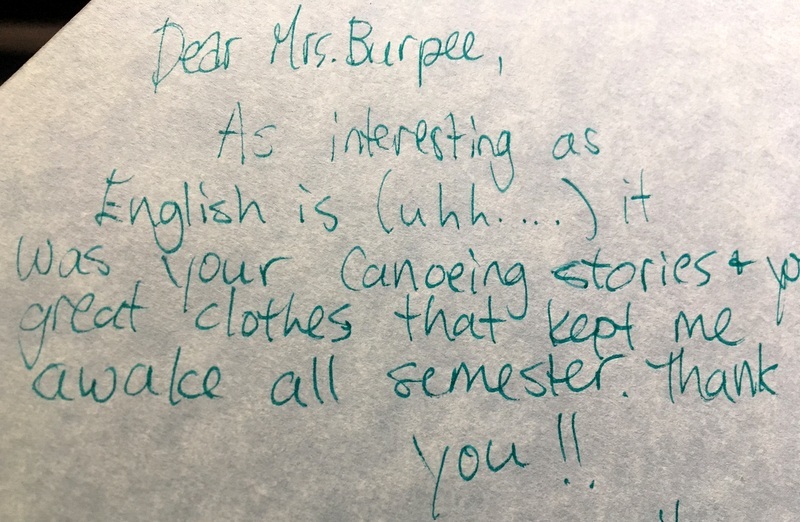 I love that the girl who wrote in my yearbook, above, also found my canoeing stories and my outfits worthy of staying awake for. As I said, whatever it takes. So, yeah, that Christian Hull video started me thinking about all kinds of things. Not just about my less-than-stellar teaching moments. But about what I learned during those cringe-worthy moments. I think the most valuable lesson I learned as a young teacher was not to take myself too seriously. And I’ve come to believe over the years that it’s probably an important lesson for many of us. Not just for teachers. But for lawyers, and doctors, and scientists, and parents, and politicians too. We should take our job very seriously, but not be too impressed with ourselves. Not get too caught up in the old ego thing. That, my friends, can be dangerous. So. Do you have any cringe-y moments in your career that you’d like to share with the rest of us? Go on, we’re listening. Thanks, Mary. I'd never heard of Joyce Grenfell before. Funnily enough, this post arrived the same day as the paperwork for my teacher's pension…I taught in primary school and at the top end (10-11 years) which suited me best. One year, as an experiment, I taught English to all the year 5 boys and the girls were taught by my fellow year 5 teacher. It was brilliant. Results were good too but we only did it for a year – another couple would have produced really interesting data, I think. We had all the usual barminess on residential trips, which we sorted out amidst huge amounts of laughter: sick kids, sick adults, rubbish hotels, vanishing kids, staff up to no good after lights out so most of my memories are around laughing until I wept. Each year, our school had Rose Day, a celebration day for the entire school with all the classes dancing for parents and the rest of the school and then a big fete and barbecue in the evening. My final Rose Day also involved the first flash-mob that the teachers did for kids and parents. All of us dancing to Uptown Funk under bright sun. One of my pupils was laughing so much he almost fell off his chair. Could have been my hi-viz tabard that did it. And yes, of course, I have been guilty of saying all the teacher platitudes: I can wait. It's your own time we're wasting here,not mine. Tell me the truth about your missing homework, don't tell me you didn't have time. I teach here full time, go home, cook and shop and I still have time… Well, I don't know what to say about that behaviour – frankly, I'm just shocked and disappointed. The joys of teaching. That hat, BTW. Great. Well… congratulations! And welcome to the club. I would have loved to be part of that flash-mob. I'll bet the kids will be talking about that for years and years. I was a high school English teacher too. (And I love clothes!) I think many teachers have had those weeks when we waited to get fired. My story: It was the days when you showed films with a projector at the back of the room and a screen at the front. I was about to show something – probably a Hamlet movie – and was standing by the projector giving some introductory remarks. I lost my train of though and felt I needed to explain. I said, "It's hard to concentrate when there is a big F**K carved on the back of one of the desks." I guess that was on of those "did I say that out loud?" moments. Ha. Ahhh! I love this post. Coming from a one of Sue's previous student teachers, I have to say not only was she an inspiration in the classroom, she was also a major style inspiration. I remember Sue must have been getting sick of the same pair of crappy black pants I was wearing to my practicum because one day she came in with a bunch of clothes she "no longer needed" from her closet. We're talking Holt Renfrew stuff, blazers, cashmere. The only downside was that I didn't get a lesson in how to care for the clothes, as I ended up putting a beautiful pink cashmere sweater in the wash and, well, the rest is history. I also remember leaving the prep room with Sue, both of us holding our stacks of books and binders in one arm and carefully balancing our tea in the other hand. One of the other teachers did a double take as I was not only learning to teach like Sue, but I was also staring to become Sue. In all honesty, Sue is not only the reason I decided to become a teacher but she is also the reason why I am teaching today. She helped me get a foot in the door and was a voice of logic, reason and advice as I was naviagating up my career ladder. I've been in the teaching game for 10 years, and now even considering taking a student teacher myself, but I'll always rely on Sue when I need teaching advice, fashion advice, or just life advice. Her balance of reason and humour is not just what made her an amazing teacher but also a dear friend. I mean seriously, how many ex students can call their high school teacher their good friend (heck, she even came to my wedding). Now if I could just get her to consider Crocs…. As a wise person once said ( I think it was Raymond Shuster ��): Life is short. Buy BOTH shirts. Oh. My. God. You are the best! The tea cups… I so remember that. And when you'd become so used to following me out of the prep room and you asked where we were going and I said the washroom. Embarrassing student-teacher moment. But I also remember all the work you did setting up that powerpoint presentation for the grade 12 class, and then the student accidentally kicked out the powercord, and you didn't have time to set it all up again before class started so you just had to wing it. And did so masterfully, I might add! Of course I've totally forgotten that pink cashmere sweater that you "washed." Ha. Raymond Shuster… made me laugh out loud. Thanks. Erica. Let's get together for lunch before school starts again! It sounds as though you chose the right career & loved it – how nice to get such a glowing comment from Erica . Re Joyce Grenfell , she was a funny lady & it was a long time before I realised her Aunt was Nancy Astor , her mother being one of the Langhorne sisters . Yep, Erica is pretty special. I think I remember someone recommending a biography about the Langhorne sisters. Was that you? Not sure now . I have read it , plus Nancy Astors biography & a great autobiography of Nancy's maid , Rose . She came from a tiny Dales village near Ripon & worked for the Astors for donkey's years . Am currently reading & enjoying the Maisie Dobbs books , recommended by someone – You? Oh Susan, thank you so much for this post. Being a teacher, a mother, and a human being myself, I´ve had my moments when not taking myself too seriously might not have saved my life but the situation. Isn´t it amazing how not being too impressed with ourselves frees us up to laugh about it. Right then, or at least a while later. Ha. Those adjustable desks and tables were treacherous, weren't they? I fell asleep during Physics class in high school and my desk collapsed. Maybe that's when I realized that if I took myself too seriously I'd be mortified frequently. Besides, embarrassing moments make great stories. At the wise old age of 21 and fresh out of college, I started teaching business education classes to juniors and seniors (mostly girls with aspirations of becoming a secretary.) I spent hours preparing each day to teach six different subjects. And do you know what my dear students remembered for my efforts? They knew how many days I went before I repeated the same outfit. Yes, they had kept track! And then a jokester sent the principal an "I love you" red carnation on Valentine's Day and signed my name. I was mortified when said principal made a trip to my classroom to thank me! I'm now retired but am reliving the teaching profession through our son, who dressed in a tutu in front of the whole student body during an assembly. He carried a sign that proclaimed "forced." The joys of being a young teacher! Nothing much gets by teenage girls when it comes to clothes. That Valentines Day gift was inspired, though… unless you happened to be the one the joke was on. Oh, god… I can imagine how embarrassed I would have been. And I go to coffee regulary with both my english teacher (she was an excellent teacher and had beautiful cashmere sweaters ) and my son's math teacher as well (separately :-)! )-they are both great ladies and we have a lot of fun together! To paraphrase one Agent James Malone of the Untouchables, " The first rule of teaching: when your shift is over you go home alive… Here endeth the lesson. " Probably one of your best posts Sue! Made for excellent reading…so well written.I especially enjoyed reading it as your career in teaching was something I thought we'd chat about in Ottawa but the time passed by so quickly! Great to read about it here. As a fellow retired teacher, I loved this post! It truly captures the essence of teaching… love the kids and don't take yourself too seriously!